Taylor Swift and LL Cool J host the Grammy nominations concert. The list of 2013 Grammy nominees shines with Nashville-based artists from a spectrum of genres. Revealed last night (12/5), the nominations reaffirmed that Music City is home to quality artists of all formats, which was a major factor in The Recording Academy’s decision to bring its nominations concert here. The Grammy Nominations Live!–Countdown To Music’s Biggest Night aired live from Nashville’s Bridgestone Arena, marking the first time the show was held outside Los Angeles. Nashville based rocker Dan Auerbach of The Black Keys earned six nominations, tying for the lead with five other stellar acts. Five of Auerbach’s noms were for The Black Keys, and he scored an additional nod for Producer of the Year, thanks to work with his band and others including Dr. John and Hacienda. Earning a substantial three nods each were Nashvillians including pop star and recent country crossover success Kelly Clarkson, revered rocker Jack White, pop/country’s unstoppable superstar Taylor Swift, country wiz kid Hunter Hayes (who could be shaping up to enjoy Swift’s cross-genre success), and CCM star Mark Hall of Casting Crowns. This places Hayes and Swift as tied for the most nominations by a country singer. They are both in the running for overall categories: Hayes for Best New Artist, and Swift for Record of the Year for “We Are Never Ever Getting Back Together.” Hayes’ other nods are for Best Country Solo Performance (“Wanted”) and Best Country Album (Hunter Hayes). Swift’s other noms come from her collaboration with The Civil Wars, “Safe & Sound,” for Best Country Duo/Group Performance and Best Song Written For Visual Media. The track was from The Hunger Games film. Country stars receiving two nominations apiece were Eric Church, Ronnie Dunn, and The Time Jumpers, which includes perennial Grammy darling Vince Gill. Also scoring two nods were CCM hitmaker Matthew West, and musical mastermind T Bone Burnett, who is spending lots of time here as executive music producer for TV show Nashville. Alabama Shakes, who recorded their album in Nashville, earned two nominations. Leading the slate with six nominations each are Auerbach, Jay-Z, fun., Mumford & Sons, Frank Ocean, and Kanye West. A slew of country performances dotted the nominations concert. Luke Bryan performed “I Don’t Want This Night To End,” while The Band Perry and Dierks Bentley joined up for Johnny Cash’s “Jackson” in tribute to the late country legend. 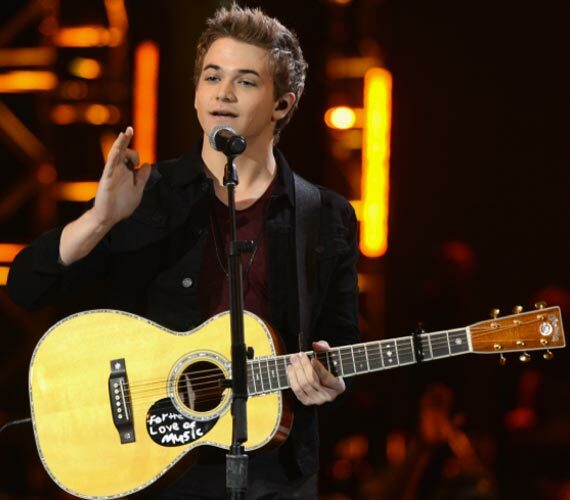 Hunter Hayes sang, rather than read, the nominations for Best Pop Vocal Album. Swift and co-host LL Cool J offered a version of her hit “Mean,” with Swift beatboxing. Maroon 5 scored two performance slots during the show, and stuck around after the televised portion to give attendees a full concert. fun. was joined by Janelle Monae for its megahit “We Are Young.” Ne-Yo burned up the stage with hot dance moves and The Who brought their brand of classic rock. Presenters during the telecast included Little Big Town, Sheryl Crow, The Lumineers and Chris Young. Winners will be announced during the live Grammy telecast on Sun., Feb. 10 in Los Angeles. The eligibility period for the nominees was 10/1/11-09/30/12. Since 2009, Nashville has been on a Grammy winning streak, started by the acclaimed Alison Krauss and Robert Plant collaboration which was that year’s top winner. In 2010, Taylor Swift racked up the most trophies and in 2011, Lady Antebellum followed suit. In 2012, Adele dominated the overall categories, but Nashville was well-represented with wins by Swift, Lady A, Alison Krauss and Union Station, and The Civil Wars.